[Photo] Australian Sea Lion (Neophoca cinerea) on North Neptune Island preserve southwest of Adelaide. Date 20 February 2005. Photo by Brian M. Hunt (http://en.wikipedia.org/wiki/User:bmh_ca). The eared seals or otariids are marine mammals in the family Otariidae - one of three groupings of Pinnipeds. 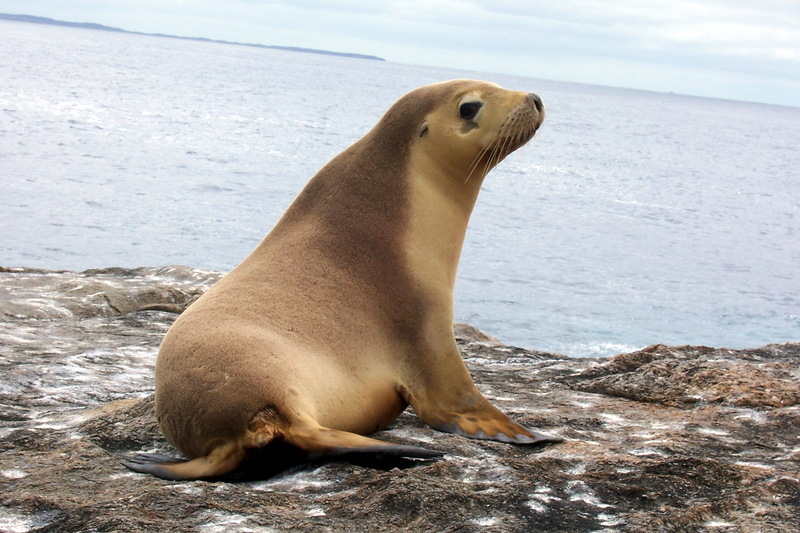 They comprise 16 species in seven genera commonly known either as sea lions or fur seals, distinct from true seals (phocids) and walruses (odobenids). Otariids are adapted to a semi-aquatic lifestyle, feeding and migrating in the water but breeding and resting on land or ice. They reside in subpolar, temperate, and equatorial waters throughout the Pacific and Southern oceans and the the southern Indian and Atlantic oceans. They are conspicuously absent in the north Atlantic. The name otariid comes from the Greek otarion meaning "little ear", referring to the small but visible external ear flaps (pinnae) which can be used to distinguish them from the phocids. Along with the Phocidae and Odobenidae, the two other members of Pinnipedia, Otаriidae are descended from a common ancestor most closely related to modern bears. There remains debate as to whether the phocids diverged from the otariids before or after the walruses. Otariids arose in the late early Miocene (20?? ?15 million years ago) in the North Pacific, diversifying rapidly into the Southern Hemisphere where most species now live. The Callorhinus (northern fur seal) genus is considered to have the oldest lineage. Traditionally, otariids had been subdivided into the fur seal (Arctocephalinae) and sea lion (Otariinae) subfamilies, with the major distinction between them being the presence of a thick underfur layer in the former. Under this categorization, the fur seals comprised two genera: Callorhinus in the North Pacific with a single representative, the northern fur seal (Callorhinus ursinus) and eight species in the southern hemisphere under the genus Arctocephalus, while the sea lions comprise five species under five genera. Recent analyses of the genetic evidence suggests that the Callorhinus ursinus is in fact more closely related to several sea lion species. Furthermore, many of the Otariinae appear to be more phylogenetically distinct than previously assumed; for example, the Zalophus japonicus is now considered a separate species, rather than a subspecies of Zalophus californius. In light of this evidence, the subfamily separation has been removed entirely and the Otariidae family has been organized into seven genera with 16 species and two subspecies. Nonetheless, because of morphological and behavioral similarity among the "fur seals" and "sea lions", these remain useful categories when discussing differences between groups of species. Otariids have proportionately much larger foreflippers and pectoral muscles than phocids, and have the ability to turn their hind limbs forward and walk on all fours, making them far more maneuverable on land. They are generally considered to be less adapted to an aquatic lifestyle, since they breed primarily on land and haul out more frequently than true seals. However, they can attain higher bursts of speed and greater maneuverability in the water. Their swimming power derives from the use of flippers more so than the sinuous whole body movements typical of phocids and walruses. Sea lions are covered with coarse guard hairs, while fur seals have a thick underfur which have historically made them the objects of commercial exploitation. Male otariids range in size from the 70 kg (150 lbs) Galapagos fur seal, smallest of all pinnipeds, to the over 1000 kg (2200 lbs) Steller sea lions. Mature male otariids weigh two to six times more than females with proportionately larger heads, necks, and chests, making them the most sexually dimorphic of all mammals. All otariids breed on land during well-defined breeding seasons. Except for the Australian sea lion, which has an atypical 17.5 month breeding cycle, they form strictly annual aggregations on beaches or rocky substrates, often on islands. All species are polygynous, i.e. successful males breed with several females. In most species, males arrive at breeding sites first and establish and maintain territories through vocal and visual displays and occasional fighting. Females typically arrive on shore a day or so before giving birth. While considered social animals, there are no permanent hierarchies or statuses established on the colonies. The extent to which males control females or territories varies between species. Thus northern fur seals and South American sea lions tend to herd specific harem-associated females, occasionally injuring them, while Steller sea lions and New Zealand sea lions control spatial territories but do not generally interfere with the movement of the females. Otariids are carnivorous, feeding on fish, squid and krill. Sea lions tend to feed closer to shore in upwelling zones feeding on larger fish while the smaller fur seals tend to take longer, offshore foraging trips and can subsist on large numbers of smaller prey items. They are visual feeders and some females are capable of dives up to 400 m (1300 ft).